Special optical adhesives enable the encapsulation of LEDs, termination of optical fibres and the assembly of complex lens systems. Optical grade epoxies, silicones and UV curable compounds offer engineers great versatility for bonding, sealing, coating and encapsulation applications. These systems adhere well to diverse substrates and offer excellent temperature resistance, stress relief and protection from moisture and other corrosive elements. These materials play an integral role not only in conventional fibre optics and optoelectronics systems but also in various specialty medical, military and aerospace devices. Manufacturers can find both optically clear and optically opaque polymer systems that can tightly bond optical components built from materials including polycarbonate, acrylic, quartz, glass and fused silica. While opaque adhesives prevent any optical leakage, clear adhesives exhibit very flat transmission curves across a wide spectrum, providing an optically clear medium that extends from UV ranges as low as 250 nm through visible and infrared wavelengths of 2500 nm or even higher (see Fig. 1). Fig. 1: Optical adhesives provide a transparent assembly solution across the visible spectrum and beyond as illustrated in this transmission curve for the Masterbond EP30 epoxy system. Their transparency at the wavelengths used in fibre optics earned these compounds an early and vital role in these applications (see Fig. 2). Besides their ability to provide structural bonding of fibres, optically clear adhesives provide the natural solution for bonding fibres to connectors during manufacturing and for splices. For splices, terminations and transparent bonds, a polymer’s refractive index and transmission characteristics are critical for ensuring maximum efficiency of optical transmission. In optical applications, any difference in refractive index at the interface between fibres or other substrates results in Fresnel-reflection loss – a reflection of some fraction of the optical signal back to the source. To meet each application’s specific requirements, engineers can find an available optical adhesive with a refractive index ranging anywhere from below 1.45 to above 1.6. At best, Fresnel loss reduces the quality of the application; at worst, it can result in failures in applications such as high-energy optical systems or fibre systems using complex modulation-signaling schemes. A high-transmission efficiency and well-matched refractive index are paramount for optical communications. 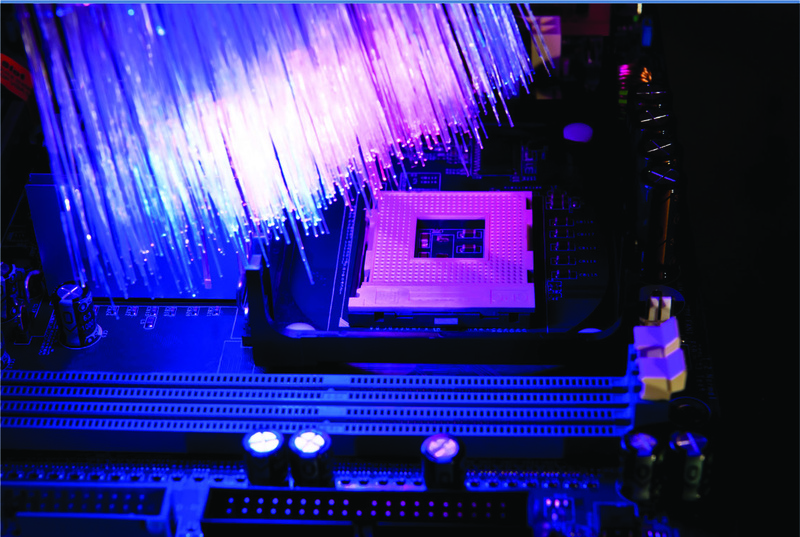 Nevertheless, other attributes of advanced compounds can arise as more critical characteristics in other optical systems in optoelectronics, medical, military and aerospace applications. For example, a precision optics assembly requires an optically transparent bonding system that allows sufficient time for precise alignment of components during assembly and maintains that alignment during and after the cure process. Adhesive that flows too freely can create difficulty in maintaining alignment during assembly and cure; one that shrinks during cure can disrupt alignment and an adhesive with mechanical or thermal characteristics poorly matched to the application can gradually introduce misalignment over the lifetime of the end assembly. To balance these types of specific assembly requirement with optical performance needs, engineers can find optical compounds such as two-part epoxies that provide a wide range of handling and curing time and curing temperature. Furthermore, adhesive systems such as UV-curing materials cure with simple exposure of light of the required wavelength. In fact, so-called dual-cure compounds cure on exposure to UV and to heat, simplifying manufacture of assemblies where UV illumination would be unable to reach concealed areas within complex geometries. For many optical applications, there are other characteristics of these adhesives that play a critical role in overall quality, performance and reliability of the end assembly. For example, the stress-reduction properties of adhesives are vital in many optoelectronic applications. Here, stress can arise at the bonded interface due to differences in the coefficient of thermal expansion (CTE) of the PCB and bonded component. Over time, temperature variations can induce stress, separation and eventual failure of the bond if large differences in CTE exist between the bonding material, the PCB and the component. bonding fibres in the factory or in the field. Polymer systems are engineered such that they can address these concerns across a wide range of CTE requirements. Furthermore, the use of additives such as aluminium oxide or negative CTE fillers such as Zirconium Tungstate can help achieve low to ultra-low levels of CTE. On the other hand, engineers can choose an optically clear silicone for applications requiring a flexible compound. As the technology of formulations has advanced, even one part silicone systems are now available to meet NASA low outgassing requirements. Additional properties of adhesives come into play in certain optical and optoelectronic applications that involve rigorous temperature and humidity testing such as 85°C/85% humidity endurance tests. Adhesives and coatings that can handle these conditions can augment the overall stability of the device significantly. Note that these compounds are equally robust in fibre optic bundling, optical replications, potting, sealing and LED encapsulation-type applications. Beyond more familiar applications in fibre optics and optoelectronics, optical adhesives have emerged as a favored solution for addressing specialised requirements in more demanding application areas such as medical, military and aerospace systems. For example, optical medical devices require toxin-free transparent adhesives that bond tightly to a variety of surfaces while remaining immune to radiation, chemical, sterilisation, and biological agents. Medical applications also present unique requirements for safe and reliable curing methods. Where temperature limitations or concerns about UV light are a concern, highly-specialised LED-cure adhesives provide a hazard-free curing approach. For example, the Masterbond LED403Med cures on exposure to 405 nm wavelength light produced by a simple LED source and conforms to United States Pharmacopeia (USP) Class VI and ISO 10993-5 cytotoxicity requirements. Military and aerospace applications impose additional requirements, combining the need for optical transparency with the ability to withstand exposure to harsh environmental conditions and extreme mechanical stress (see Fig. 3). For these high-stress applications, adhesives provide a degree of hardness and resistance to stress that is vital for systems exposed to sudden acceleration, vibration and mechanical shock. In these cases, each adhesive’s characteristic Young’s modulus reflects its ability to respond to mechanical stress. An adhesive with a low Young’s modulus can reduce stress caused by mechanical shock or induced by thermal expansion. Fig. 3: Optical adhesives provide the strength needed to withstand extreme mechanical stress without interfering with the transmission across a wide range of wavelengths. By contrast, an adhesive with a higher Young’s modulus will remain more rigid despite externally applied stresses. Advanced adhesive technologies allow engineers to find specific systems with a Young’s modulus needed to achieve a balance between compliant stress relief and rigid dimensional stability. Adhesives face even more extensive requirements for space-based optical systems. Along with the ability to withstand severe vibration during launch, optical adhesives need to remain immune to continued thermal shock and the vacuum of space itself. In fact, optical adhesives such as Masterbond Polymer System EP29LPSP withstand cryogenic shocks as extreme as a rapid plunge from room temperature down to liquid helium temperature (-269°C). 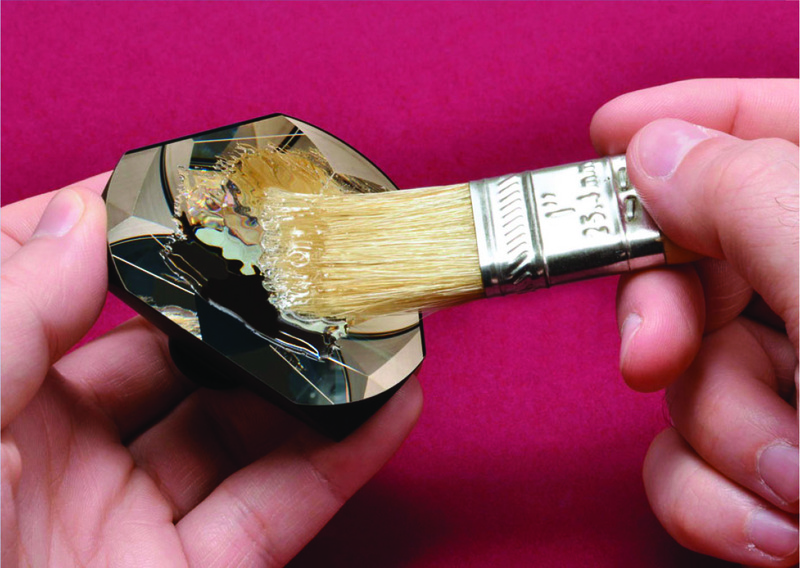 Optical adhesives also resist the effects of exposure to vacuum, whether in space or Earth-bound vacuum chambers. Placed in a vacuum, materials can begin to outgas any volatile constituents, possibly resulting in shrinkage of the material itself and accompanying condensation of the outgassed compounds on optics and other sensitive surfaces. Optical epoxy systems such as EP29LPSP feature very low outgassing characteristics, confirmed through the NASA low outgassing test (ASTM E595). Optical systems present unique assembly challenges, further complicated by specialised application needs and environmental factors. While some applications require optical clarity across a specific wavelength range, others require an opaque coating to protect light-sensitive components. At the same time, assembly requirements can drive the need for adhesives with specific viscosity, strength and durability characteristics and cured through specific combinations of temperature, UV, or LED light illumination. Optical adhesives offer manufacturers the ability to meet these varied challenges with a broad array of options, easily addressing specialised applications requirements for optical clarity, bonding strength and protective capabilities.